BamaHoops: Tide Lays Huge, Steaming Log against Bulldogs, Georgia 65 Alabama 46. Tide Lays Huge, Steaming Log against Bulldogs, Georgia 65 Alabama 46. You probably don't want to read any more about this game than I want to write about it, so I'll keep this relatively short, at least by my standards. It was a pathetic, embarrassing, pitiful performance. Dazon Ingram missed the game with the flu, but was on the bench and looked horrible. I'm not a doctor, and I commend him for wanting to support his teammates, but given the highly contagious nature of the flu, I question the wisdom of allowing him on the trip, much less his presence on the bench. The rest of the team played as if they had the flu. Herb Jones got the start in place of Ingram, and despite being the only player on the floor even attempting to play defense in the first half, he was horrendous on the offensive end. We've spent a lot of time discussing the playing rotation here, and Ingram's illness further complicated things there for this game. Let's look at some numbers. Sexton played 33 minutes, that's closer to the 35 I've been calling for from him. He was the only guy who showed up today. Unfortunately, he still shared the backcourt with AJ for extended periods, including the run in the first half that allowed UGA to gain their first 20 point lead. Speaking of AJ, he got 22 minutes in this crap-show (edited to save bobbyjack some work). Donta has played fairly well at times, and actually led the team in rebounds with 6 (lol) despite playing only 16 minutes. He did appear visibly frustrated at times, which I actually appreciated, as his body language at least indicated that he gave a damn, unlike everyone else on the team not named Collin Sexton. Meanwhile we dusted off Galin Smith for 18 minutes, and Alex Reese got 8, mostly in the first half. The first half was one of the worst defensive efforts I have ever seen. We didn't block anybody out, we had the same issues we've had with switching on screens in the man, and our rotation in the zone was criminally lacking. We did press a little more, with some limited success, but never controlled the tempo. To compound matters, we tried to speed things up on offense after giving up big scores by taking quick, ill-advised shots. I felt like I was watching a game during the Gottfried era, wide open 3's galore and getting blown out on the road by a team we should probably beat. Sexton played well. Key seemed to regress after making some improvement at Vandy. JP actually played some defense in the second half, but was a liability otherwise. We are a below average team when he isn't shooting well, and right now, that's more often than not. The defensive intensity improved a lot in the second half, even if the technique did not. We committed a ton of fouls, but at least put forth some effort. I can't comment on the last 5 minutes as I decided to get a head start on the drive back to Birmingham. I very rarely leave games early, and I'll support the team as long as I feel they are giving maximum effort. I don't think that was the case in the first half, and if they aren't going to give me 40 minutes, I don't feel obligated to give 40 minutes of support either. Yes, we are young. Yes, we've had injuries. Those are all parts of the game, especially the college game. This is our most talented roster in 20 years, and we're losing to inferior teams. At the end of the day, responsibility for that lies at the feet of the head coach. I don't get a sense of urgency from CAJ. The assistants seem more passionate on the sidelines. One of the big questions when we hired him was, could he adapt to the college game? He's proven he can recruit. He's proven he can market the program. I don't think anybody can question his basketball knowledge from an Xs and Os standpoint. Can he manage and motivate a roster of talented college kids? It's only year 3, but we need improvement in this area, and fast. He needs to realize every game is much more important in a 30 game schedule versus an 82 game schedule. Also, waiting until the 4th quarter (or late second half) to start bringing it on defense isn't going to cut it here. We are basically seeing what happens when a good college team thinks they are an NBA team and plays accordingly at this level. 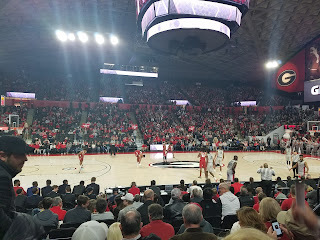 Stegeman Coliseum is an underrated venue. They've made a lot of improvements over the years, and it's a fine place to watch a game. It holds about 10,500, and it was sold out, with over 10,000 in attendance. We only had a couple-hundred fans there, including athletic director Greg Byrne. He walked up the stairs past us to the concourse in the first half when things were going badly, and did not look very happy, but I did see him down on the floor later in the game. The UGA fans were respectful. Football culture still rules there, as I over head a lot of conversations focusing on Monday's game. To their credit, they were supportive of their team while mostly just leaving us alone. Up next, we play the South Carolina Gamecocks in Tuscaloosa Tuesday night at 6 pm on the SEC Network. I'll be there, and I'm curious to see how many will join me.